Senses Temperature, Humidity, Barometric pressure, and/or Light. The nearly instant automated responses made by the relay and LED allow appropriate responses (activate fan/alarm siren/etc) to occur before the monitoring application is aware of the alarm. 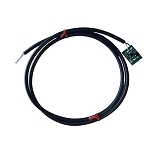 The EDS Environmental sensors have been designed to be easily read and controlled.